Ciel Bleu is one of the most fantastic restaurants in all of Amsterdam. The restaurant has two Via Michelin stars, which in itself is extraordinary, and besides that it is located on the 23rd floor of Hotel Okura in Amsterdam. 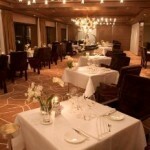 The restaurant has very professional chefs, and a sommelier presenting the different wines to the guests. 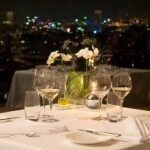 It is no secret that a table reservation is needed in Ciel Bleu Restaurant.